1. When the settlement name ends in “ria” in English, as in the case of Agios Ilias, I translate it into Linear B as Akio Iriya, not Akio Iria, since the latter is not what you would really expect in a Linear B toponym, whereas the termination YA is extremely common in Linear B vocabulary regardless. 2. When the settlement name ends in “sios/sion” or “ios/ion” in English, here again I translate it as YO, since that termination is also extremely common in Linear B vocabulary regardless. Examples are (a) Korifasion which translates as Koriwasiyo in Linear B, the “f” being of course the digamma, otherwise known as “wau”, which was always rendered in Linear B words by the W+ vowel series of syllabograms, i.e. WA WE WI & WO & (b) Aigion, which translates as Aikiyo in Linear B. In fact, the syllabograms YA & YO are at the very highest frequency level of use among all the Linear B syllabograms, another extremely sound reason for preferring them as word terminations over the simple “ria” and “rio” endings, which just do not wash with me. 3. As illustrated by Korifasion = Koriwasiyo in Linear B, so also Linear B Epidawo for Epidauros. In other words, the cluster “auro” in the Greek equivalent of this site is regressively extrapolated to “awo” in Linear B, the intervocalic “r” disappearing altogether. This is standard Mycenaean orthography. 5. 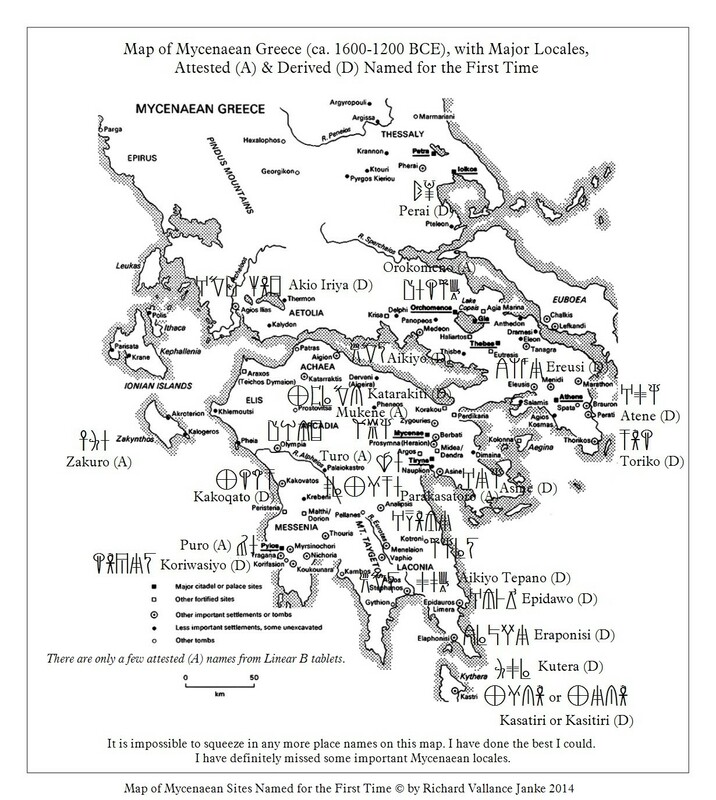 Since Mycenaean words never end in consonants, even though they are Greek, all consonant terminations in place names must be dropped, as in Linear B Puro for Pylos, Orokomeno for Orchomenos & Aikio Tepano for Agios Stephanos. Note also that the initial “S” in Stephanos must be dropped, again for the same reason, namely, that Mycenaean Greek forbids two consecutive consonants. So where there are two of them, the vocally weaker of them must be eliminated, in this case, the weaker sibilant “s” yielding to the stronger plosive “t”. I know, I know. Practically all of you who are well versed in ancient Greek are going to (loudly) protest, “But so many ancient Greek words end in a consonant!” True enough. But you will just have to swallow your pride, and accept the fact that, even if Mycenaean Greek words were pronounced with consonant endings (which is highly likely to have been the case), the Linear B syllabary is utterly and hopelessly incapable of accounting for them. So you will have to do the same thing as the (rest of us) Linear B specialists, get over it and get used to it, frustrating as it is. Even after two years of reading 3,000 + Linear B tablets, I myself am often still unable to wrap my poor skull around this phenomenon, let alone around several other apparent vagaries of Linear B spelling. But there are plenty of reasons why Linear B orthography is the way it is, not the least of which is that the Linear B syllabary is the child or direct spinoff of Linear A, a syllabary which was never meant to be used to spell Greek in the first place. And please do not protest again. The Mycenaeans had to use Linear A or some sort of syllabary, because the blasted (Greek) alphabet hadn’t been invented yet! So give the poor blokes a break. They did a pretty bang-up job of it, if you ask me, considering the insane odds they were up against just trying to make Linear A square syllabograms fit into round holes in Mycenaean Greek. I would like to see you try to do that. Good luck. Fat chance. So there you have it, a neat little lesson in the apparent vagaries of Mycenaean orthography. I say apparent, because in fact they are not. But I can tell you one thing. They sure cause a lot of headaches to translators who wish to regressively extrapolate ancient alphabetical Greek words to their Mycenaean forbears. Remember! The derived Mycenaean toponyms on this map are precisely that, and nothing more. While their Linear B equivalents are my own, they are not even close to mere guesses. Given the Mycenaean orthographic conventions I have outlined above (at least as I see them), these spellings are perfectly sound... except of course in those instances where some Linear B experts might take exception to some of the conventions as I have outlined them above, which some of them are bound to do. If anyone does take exception to any of the derivative (D) place names I have assigned, for heaven’s sake, let me know! Nothing is cast in stone (or even clay, for that matter) where it comes to translating into or from Linear B. Trust me on that one. Never believe any Linear B translator, myself included, of course, or should I say, especially myself, has a monopoly on translating any Greek word from certain ancient Greek dialects (but not all of them, by a long shot) into Mycenaean Greek in Linear B, or vice versa. Anyone who does make such a claim is leaving him- or herself wide open as a target for being roundly, and dare I say, soundly criticized. And the more I am criticized, the better. I have always been the doubting Thomas, anyway.